It goes without saying that a diagnosis of Alzheimer’s disease or dementia is devastating. Not just for the person receiving the diagnosis, but for the whole family. And when the time comes that your loved one needs more care than can be provided at home, it feels like yet another major blow for everyone. But memory care communities in Florida are nothing like the nursing homes of the past. Specifically designed for those with Alzheimer’s and dementia, they are not merely a place to safely stay; memory care communities today are places where your loved one can thrive. Memory care nurtures those with Alzheimer’s disease and dementia through specifically trained staff, individualized support, and 24-hour assistance. But what does that mean, really? At their core, memory care communities are focused on improving quality of life and helping residents maintain their individuality and independence for as long as possible. A key component in doing that is through the daily activities memory care communities provide. 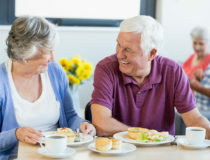 Residents in Florida memory care communities can expect daily activities that include sensory stimulation, cognitive therapies, physical and occupational therapies, and exercise. Social engagement is also a focus, so you’ll find numerous opportunities for residents to interact as well. These activities all work together to help slow the progression of the disease as well as to give residents purpose and enjoyment. Music and/or art therapy may also be used as research has shown they are beneficial in helping to reduce aggression and agitation in memory care residents. 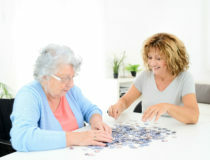 The staff will also keep your loved one on a familiar daily routine to provide a sense of comfort and stability. Memory care communities in Florida also serve families by encouraging them to be partners in their loved one’s care and helping them to better understand dementia’s effect on brain function and behavior. Sonata’s memory care communities offer warm, inviting neighborhoods with purpose-built design and state-of-the-art safety features. In addition, we also embrace renowned dementia care expert Teepa Snow’s Positive Approach to Care. Proactive and facilitative focus: Rather than do tasks for residents, we perform tasks with them to create confidence, self-control, and trust. Ability-centered approach: Evaluations and care plans focus on each resident’s current abilities to maximize engagement, function, health, and happiness. Person Centered care: Integrating residents’ life stories and preferences into daily care helps to improve personal connections, independence, and emotional well-being. In fact, we’ve won back-to-back “Best of the Best” awards from the Assisted Living Federation of America (now Argentum) for this memory care model. 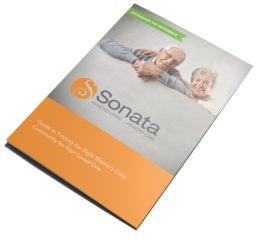 For more information on daily activities in our Florida memory care communities, contact Sonata today to schedule a visit.